We left Mae La Oop and the students staying for their internships on a rainy Friday morning. After saying our goodbyes to our homestay family, our host drove us in the back of his truck the 11km down the mountain to the closest town. As we reached the town we came upon a songtheow (a converted truck, with a roof over the bed and two rows of seats facing each other in the back, that is used as public transportation). Our host honked and the songtheow stopped. He then arranged for the driver to take us to Chiang Mai for 160 baht per person. The driver picked up and dropped off other passengers along the way, but much of the ride we had the space to ourselves. We made it to Chiang Mai in about 4 ½ hours. Easy peasy. In Chiang Mai, we did a whole bunch of nothing. Rand got sick so we ended up staying a week instead of just a few days. And I have to say, if you need to chill some place for a while, Chiang Mai is not a bad place for that. 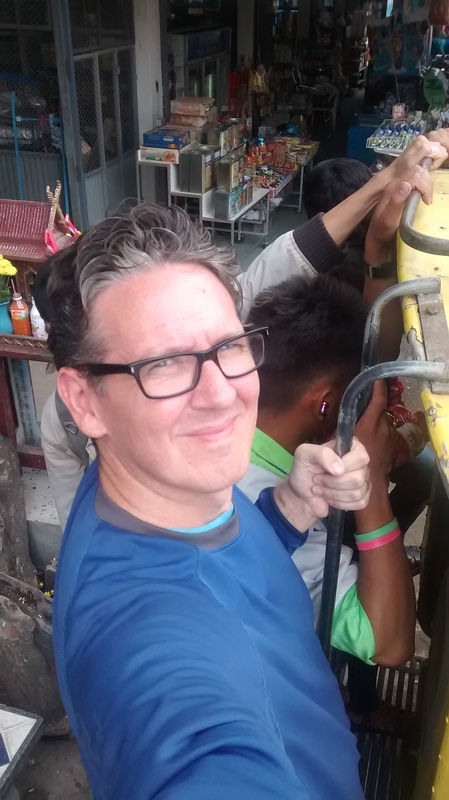 When Rand was feeling up for riding on the winding road up the mountains, it was time to figure out how to get to Mae Chaem where the other group of students were doing their internships. Since Rand was still a bit under the weather, we thought about hiring a songtheow driver to take us to Mae Chaem. I went out to the Ta Phae gate where the red songtheow drivers hang out and asked around. These drivers will happily take you to Tiger Kingdom or Doi Suthep temple or any other nearby attraction for a bargained upon price. The first driver I asked looked at me questioningly at first, then made a phone call (I think maybe to his wife). I couldn’t understand a word he said, but I think the conversation went something like this. “How much do you think they will pay? Don’t take less than 2500 baht,” says his wife. “OK, 3000 baht.” The driver says to me. I laugh. “1000 baht,” I counter. He shakes his head. I don’t up my bid. It will be way cheaper to take public transportation. But I try one more time with a different driver. “I want to go to My Cham tomorrow,” I say with terrible/nonexistent Thai tones. “Where?” says the songtheow driver. “My Cham,” I repeat slowly. Clearly hiring our own driver is going to be too expensive. We laugh a minute longer about my horrible Thai pronunciation and I head back to the hotel to make plans to take a public songtheow to Mae Chaem. First we needed to go to the bus station to catch a songtheow going to Chong Thom. We took a red local songtheow to the bus station. At the station, an eager songtheow driver approached me. “Chong Thom?” I said and he were directed me to the correct yellow songtheow. It cost 35 baht a piece for this leg of the journey. In Chong Thom the driver dropped us off where the songtheow heading to Mae Chaem was parked. We had about an hour and a half wait until the songtheow was scheduled to leave, so the driver motioned for us to sit down on some benches nearby. As we sat there, people started getting in the back of the truck. I wasn’t sure if we should also get in, but the driver told us to wait on the bench, so we did. When there was still a half hour until departure time, the back of the songtheow was full. I wondered if we should try to squeeze on or just wait for the next schedule departure. Rand said we should just wait and see. Our bags were laying next to the truck and soon someone started loading them onto the top of the songtheow. I guess we were going to squeeze on. “Mae Chaem,” I said, trying to pronounce it right this time. She pointed to the back seat of the cab. I backed out of the songtheow and told the girls to follow me to the front of the truck. They looked confused since we normally sit in the back. I opened the door, pushed up the front seat and climbed into the back seat of the cab with the girls. The four of us rode squished in the row of seats meant for three people. Two more girls shared the front seat. But we were more comfortable than Rand. He ended up riding on the back of the songtheow with five others, standing on the step and hanging onto the ladder leading to the roof. At one point he climbed on the roof with the luggage. Which was fun for him until it started raining and tree branches hit him in the face. Rand counted 26 people total riding from Chong Thom to Mae Chaem. And we all made it there safe and sound. 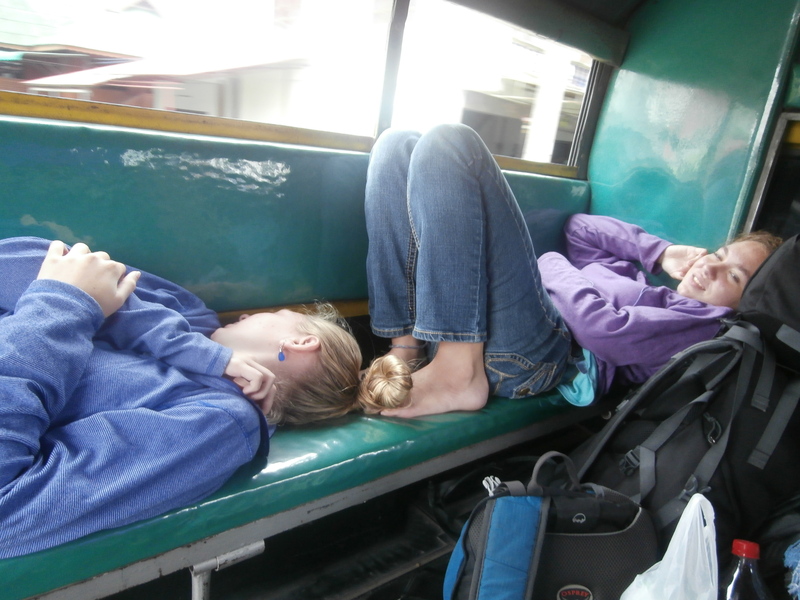 Except that when we got to the bus station, we had no idea where our homestay was. All we had was a picture of the police box at the turn off from the main road and instructions to take the third right up the hill. The students we were meeting up with had already been there for two weeks. They didn’t know what time we would be arriving, but one couple happened to be walking down the main street and saw Rand on the top of the songtheow. They caught up with us at the bus station and took us to our homestay. The homestay was about a kilometer outside of town. It would have been difficult to find it without them. But as Rand says, “Everything always works out.” And so we succeeded in taking public transportation out of a small mountain village to the city and back to a small mountain town in a country where we don’t speak the language. Yeah us! Fully awesome! I LOVE all of your posts!